"You can also use tart apples in these light-as-air muffins. The parchment paper cups are very easy but make them look wonderful and special enough for a party! Try serving them warm with some whipped cream cheese." Preheat oven to 400 degrees F (200 degrees C). 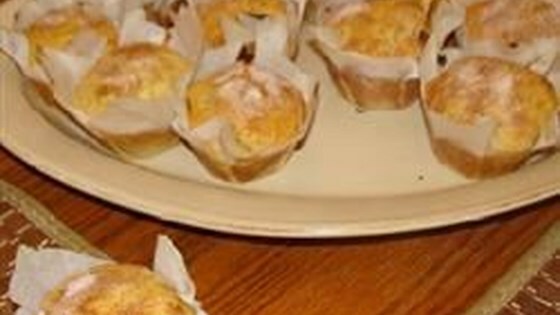 Line a 12-cup muffin tin with paper liners. Sift flour, 3/4 cup sugar, baking powder, 1 teaspoon cinnamon, baking soda, nutmeg, and salt together in a large bowl. Add pears; stir to coat evenly. Combine buttermilk, egg yolks, oil, and vanilla extract in a bowl; mix well. Stir into the pear mixture until batter is just moistened. Beat egg whites in a separate bowl with an electric mixer until stiff but not dry. Fold egg whites into the batter until just barely incorporated. Fill muffin cups 2/3-full with batter. Combine 2 tablespoons sugar and 1 tablespoon cinnamon together in a bowl; sprinkle over the batter. Bake in the preheated oven until light golden brown and tops spring back when lightly pressed, 25 to 30 minutes. To make easy parchment paper muffin liners, find a glass or cup that fits the shape of your muffin tin. Cut 5-inch squares of parchment paper. Turn glass upside-down. Center a parchment piece on top of the glass and press it down, creasing it to form a cup. Lightly spraying your muffin tins with vegetable oil will help to hold paper cups in place. You can use apples in place of pears if desired. For more even baking, turn the pan halfway through the baking time.